It's an hour or so before sunrise over Rocky Mountain National Park on this spring morning. 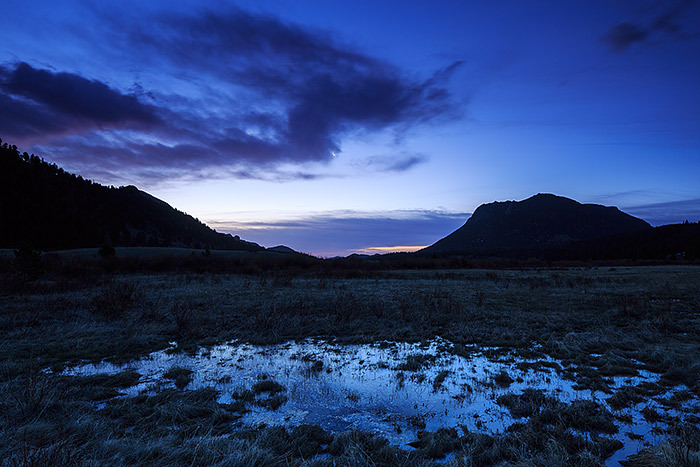 The winter snowmelt has formed puddles in the meadows of Horseshoe Park which reflect the predawn light cast over the landscape. A crescent moon hovers over Deer Mountain and just a hint of color from the impending sunrise can be seen in the clouds over Horseshoe Park. Photo © copyright by Thomas Mangan.